Focus RS discount? | What Car? 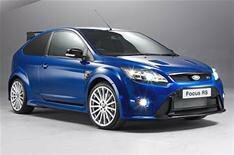 I want to buy a new Ford Focus RS, but before I go to the dealer with a deposit, I was wondering if you could give me a rough idea of how much discount I should aim for. Also, do you have any information on the colours that will be available? If you've got the cash, there's never been a better time to buy a car. Manufacturers and dealers are desperate to sell stock, so you can expect a bigger discount than ever before. However, there are a few models that, even in the current economic climate, you'll be lucky if you get any discount, and the eagerly anticipated Focus RS is one such car. Ford is only bringing a limited number of the RS to the UK, and many have already been sold. So, if you want one, get to your local Ford dealer quickly and be prepared to pay full whack (25k). As far as colour goes, there's a choice of three: Ultimate Green, Frozen White or Ford Performance Blue (the colour of the original Focus RS).